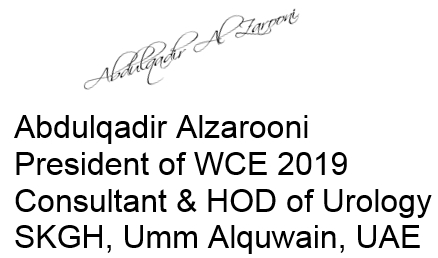 We are pleased to announce that the Endourology Society will partner with the Emirates Urology Society to host the 37th World Congress of Endourology 2019 (WCE 2019) along with the 8th Emirates International Urological Conference (EUSC 2019). 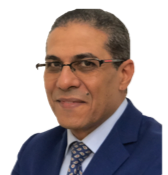 With WCE returning to the Middle East after a long hiatus, the congress aims to bring endourologists from all over the world to Abu Dhabi, the capital city of United Arab Emirates on 29 October – 2 November 2019. 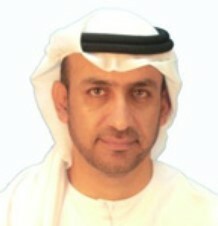 EUSC 2018 has made its mark in the region as the leading urological meeting that continues to grow in terms of participation for over 40 countries, providing the highest level of education in urology field and helping urologists in the region to strengthen and promote the practice of urology and improve the quality of patient’s care. The collaboration with World Congress of Endourology will take this to further new heights and also give the participants the opportunity to explore the best of both the conferences at a single location. The endourology field is an exciting area in which to work, and 37th version of WCE 2019 will continue to meet the needs and bring inspired people together, to ensure our conference remains at the cutting edge. We would like to give you an idea of what you can expect and what we hope to achieve over the few days of WCE 2019, it is not only the outstanding scientific program or the chance to meet the world class experts in the field of endourology but it is the opportunity of experience exchange and bridging the gaps of different practice all-over the world. We feel great pride in welcoming you to Abu Dhabi where captivating culture, breath-taking luxury, exhilarating adventure and the warmth of Arabian hospitality await you. Whether you are making your first trip to Abu Dhabi, or are on a return visit, whether exploring the Emirate’s many natural islands, or riding the world’s fastest roller coaster, you will discover a captivating destination that will leave you asking for more. Before we close, we would like to encourage each of you to attend WCE 2019 and bring your expertise to our gathering. You have the vision, the knowledge, and the experience to help us pave our way into the future. You are truly our greatest asset today and tomorrow, and we could not accomplish what we do without your support. 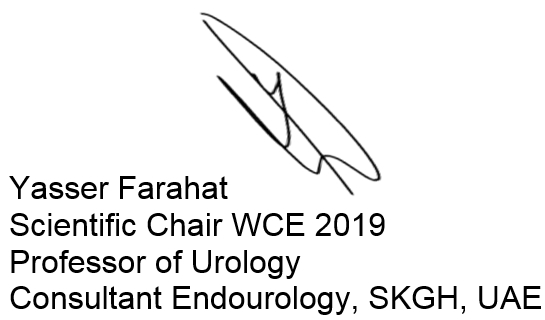 Throughout WCE 2019, we ask you to stay engaged, keep us proactive and help us shape the future of endourology. Our personal respect and thanks go out to all of you.